While there's nothing unusual about boiling temperatures in Southern Oregon, the last half-decade has smashed heat records on a regular basis. 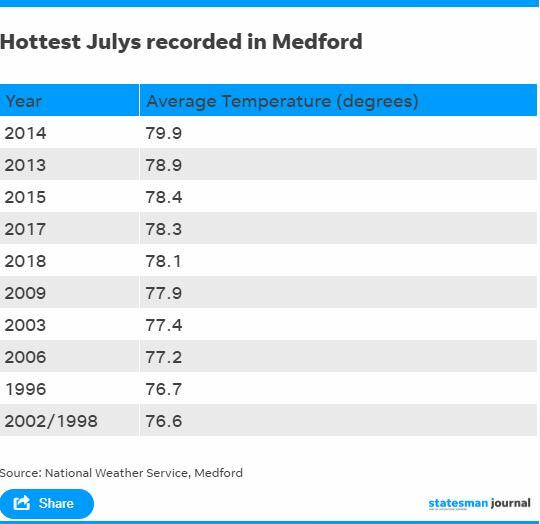 The five hottest months of July ever recorded in Medford have all taken place in the last six years, according to the National Weather Service. And eight of the 10 hottest Julys have occurred since 2000. While there’s nothing unusual about boiling temperatures in Southern Oregon, the last half-decade has smashed heat records on a regular basis. This July, the average temperature was 78.1 degrees, good enough for fifth-hottest in records that date back to 1911. The typical July temperature is 73 degrees. This July had nine days above 100 degrees — short of 2014's record of 13 days above 100 degrees. The hot temperatures help explain the difficult wildfire seasons the region has faced. Wildfire smoke has brought hazardous air conditions three of the last four years to Southern Oregon. "The type of heat we've been seeing makes everything about fire more explosive," said Kale Casey, information officer on a Type 1 wildfire team that works large fires across the West. "It's not one thing — it's a 'Swiss cheese' effect that makes every part of a forest more receptive to fires and major fire growth." One of the main reasons Southern Oregon has been setting records in terms of average temperature isn't necessarily midday heat — it's what happens at night. Nights haven't been as cool or humid over the past decade, National Weather Service meteorologist Marc Spilde said. That sets the stage for wildfire growth, say wildfire experts. "What we've been seeing is that you lose that nighttime recovery window, so that we have fires that continue to burn at night in a way they didn't in the past," said Casey, whose team is working this year's Taylor Creek and Klondike Fire, and worked last year's Chetco Bar megafire in southwest Oregon. Hot and dry temperatures don't guarantee a wildfire-filled summer, they just tip the scales in that direction, experts say. The flames still require ignition, and that arrived this year in the form of a mid-July lightning storm that threw down 1,000 lightning strikes across Southern Oregon, igniting at least 160 wildfires. Fire teams attacked the blazes right away in almost every case, hoping to quell them while they remained small. But boiling temperatures and winds thwarted those efforts in many cases. "Those fires really grew fast, because just a few days after the lightning strikes, you had some of the hottest days in Oregon history," Casey said. Climate scientist Kathie Duello, of Oregon State University, said hotter weather loads the dice toward more severe wildfire seasons in Oregon. The hot weather dries out fuels that many experts believe are overloaded in Southern Oregon. Whether because of decades of fire suppression or less active logging, there's general acknowledgment that heat and dead fuel is a bad combination. Oregon Rep. Carl Wilson (R-Grants Pass) said legislative action has to be taken to reduce excess fuels that dry out and create tinderbox conditions. “I’ve been a member of the fire caucus in the Oregon legislature and we’ve talked about a lot of the things that need to happen, but ultimately almost everything points to the U.S. Congress,” Wilson told the Statesman Journal last week. “The Oregon delegation has to be the adults in the room and get us toward doing something about the excess fuels that cause these fires – that’s where the action is." How does snowpack play a role? It hasn't just been a hot summer in Southern Oregon, however. Snowpack in the region has also been below average, including this past winter, when snowpack was only 60 percent of normal on April 17. The reason, said Scott Oviatt, snow survey hydrologist for the Natural Resources Conservation Service, was temperature. The average high temperatures — the day’s warmest moment — was slightly cooler in the mountains of Oregon’s northern mountains, compared to the south. 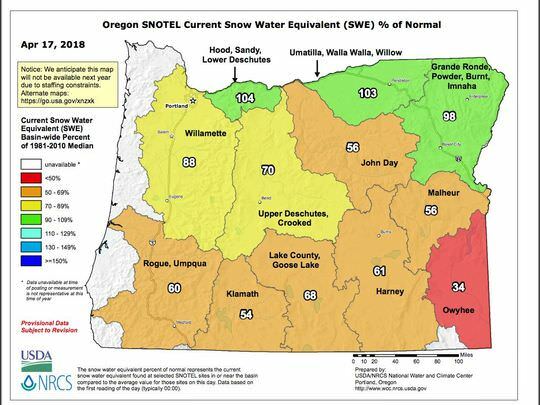 The result was decent snowpack in northern Oregon but well-below conditions in the south. “When it’s just a little bit warmer, and warmer for longer, those areas get all or mostly rain, instead of all or mostly snow,” Oviatt told the Statesman Journal in April. That small difference can have a big impact over the summer, he said. Mount Ashland Ski Area, south of Ashland, was unable to open in 2014 and has faced an annual struggle to get enough snow to open. The Taylor Creek Fire forced closure of the popular Rogue River for almost a week during the height of tourist season. The river has reopened, but road closures have impacted outfitters' ability to run trips on the iconic "wild section" of the river. "Overall, we have to learn how to better live with fires in Southern Oregon," said Pete Wallstrom, owner of Momentum River Expeditions in Ashland. "Fire is a natural part of our river canyons and they are not going to go away anytime soon. "We need to protect people and property always and control fires when we can," he said. "But also understand that they are natural in some forests and that they are not 'destroying' our beautiful wild areas."